According to the ministry, the statement is aslo "absolutely unprofessional"
MOSCOW, December 11./TASS/. 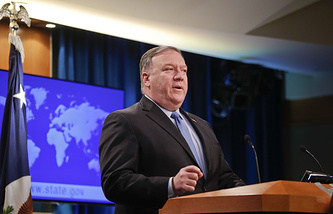 Statements by US Secretary of State Michael Pompeo concerning the dispatch of Russian strategic bombers to Venezuela are inadmissible and unprofessional, the Russian Foreign Ministry said in a commentary on Tuesday. "Of course, we understand that the format of ‘tweets’ does not bind anyone to anything in the US in general, and every user is free to speak as he (or she) thinks fit, deciding on his own whether to go beyond the bounds of decency," the ministry said. "However in this situation an official is involved, so this disregard of the rules of diplomatic ethics cannot be seen as a statement ‘to dismiss’," the ministry stressed. "What the secretary of state said is inadmissible, not to mention that it is absolutely unprofessional," it added. The Russian Defense Ministry said in a statement on Monday that two Tupolev Tu-160 strategic bombers, an Antonov An-124 military transport plane and an Ilyushin Il-62 long-range aircraft had arrived in Venezuela. The ministry pointed out that the aircraft had covered a distance of 10,000 kilometers and flew over the Atlantic Ocean, the Barents, Norwegian and Caribbean Seas in strict compliance with international rules of the use of airspace. This is not the first such flight performed by Russia’s Tu-160 warplanes as they flew to Venezuela in September 2008 and in October-November 2013. Venezuela’s Defense Minister Vladimir Padrino Lopez said that the Russian aircraft would participate in joint flights with Venezuelan planes. "Russia's government has sent bombers halfway around the world to Venezuela. The Russian and Venezuelan people should see this for what it is: two corrupt governments squandering public funds, and squelching liberty and freedom while their people suffer," Pompeo wrote on Twitter later.